The latest Magic: The Gathering expansion from Wizards of the Coast features a new mechanic (Transform) for a new physical object: double-faced Magic cards. The cards do not have the traditional card back that we have all come to know and love. Instead, both sides of the card are fronts. The transform mechanic is identical to the mechanic that flipped certain cards in previous expansions upside down (rotated them, without turning them over on their backs). 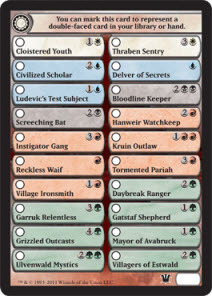 If you’re like me, your first thought is that Wizards must have thought this through for a good, long time in order to solve the obvious and numerous problems that must arise with these cards, and you might hope that they settled on something elegant yet practical. If so, you’re going to be disappointed. They tackle the problems with tossed together kluges that appear to be the first thoughts to cross their minds. For instance, how do you put the cards with no backs into your deck and shuffle? If it were me, I would assume that either a) every double side card comes with its own proxy, or b) the cards enter play through some other effect, such as a minion of some kind. Pick one. Nope. The rules according to source are that you must choose one of two methods. Either a) you play with card sleeves, removing and reinserting the card each time it needs to transform. 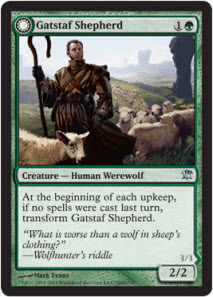 Or b) you use a multi-creature proxy card that comes in “many” Innistrad packs. 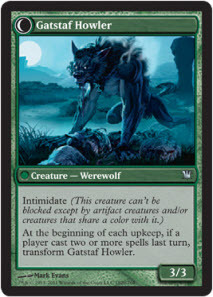 The multi-creature proxy card lists all currently existing double-faced cards with little checkboxes, that you must mark with a pen before inserting into your deck. Good grief. Really? What if you don’t play with sleeves, or you don’t want to keep pulling cards in and out of them? What happens if you don’t happen to get one of those “many” packs? What if you get too many of those packs and too many sucky, otherwise useless proxy cards? What happens when Wizards adds more double-faced cards? What happens if you mis-mark the card or it smudges or the ink comes off on the back of your other cards? What if you don’t freakin’ want to write on your Magic card with a freakin’ pen? Couldn’t you pick one actually good solution and stick with the one, instead of providing two bad ones? Source also addresses drafting, copy effects, and “flip target card face down” effects, all handled with approximately equal non-grace. You forgot “good luck telling whether your proxy is Villagers of Estwald or Mayor of Avabruck when it’s sitting fanned in your hand.” Guess you’re not supposed to hold more than one proxy at a time. Getting the necessary card proxy in the same pack as the card it proxies is more expensive than you think. That’s why the boosters are not truly “random” either but are part of cycles that in blocks. I feel many players that are competitive and smart will take to shuffling their hands and looking at one card at a time… so that people do not know they are scanning the list card with a check on it or just use sleeves. But, hey, I can’t afford to play anymore so what do I know?